The simple answer is living in balance between emotions and logic. It’s when you have the confidence to deal with difficult decisions or situations because you’re in charge—not your emotions. You’re living with balance, mindful awareness, and the knowledge that the key to managing stress and anxiety lies in understanding your emotions (see the Big 8 Emotion Families). Learning how to be mindful and manage your emotions is key to Wise Mind Living, and learning to do this is a skill. Like any skill, mastering your emotions takes practice, but just like driving a car or learning to play piano, the more you practice the better you’ll get. Everyone has the capacity for Wise Mind Living because we all have wisdom within us. However, to fully understand this concept, you need to understand Logic Mind, Emotion Mind, and Wise Mind— the three states of mind coined by Dr. Marsha Linehan, the founder of Dialectical Behavior Therapy (DBT). Logic Mind uses logic and cause and effect reasoning to guide the individual. Although Logic Mind is crucial to dealing with reality, many of life’s problems have an emotional aspect. Emotion Mind is characterized by your emotions guiding how you think, feel, and behave. If Logic Mind runs cool then Emotion Mind runs hot. 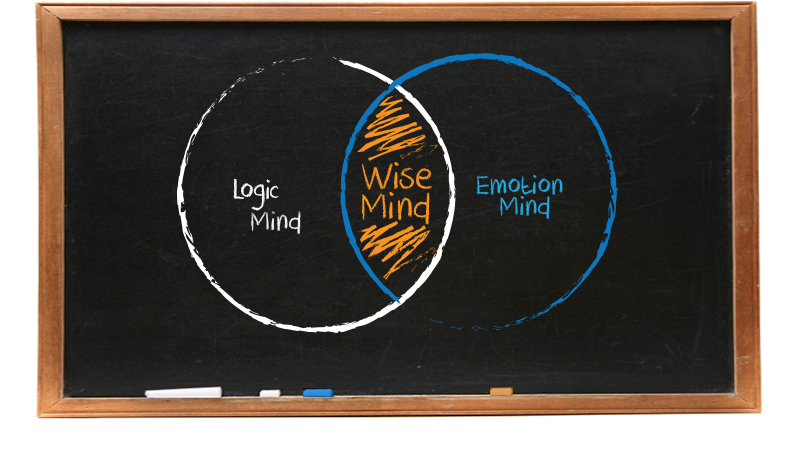 The synthesis of Logic Mind and Emotion Mind is Wise Mind. It brings together the rationality of Logic Mind and the sensitivity of Emotion Mind to create a balanced state of mind that results in Wise Mind Living. Here’s a post I wrote with more details on Wise Mind Living.